Put the steaks in a shallow dish. Mix the soy sauce, five-spice and 1 tbsp of the balsamic vinegar in a small bowl, pour over the steaks, then marinate in the fridge for 2-24 hours. Preheat the grill, remove the steaks from the marinade and grill to your liking (2-3 mins each side rare, 4-5 mins each side medium, 5-6 mins each side well done). Leave to rest for 5 mins while you grill the tomatoes and mushrooms. Thinly slice the steaks and mix with the spring onions, carrots and cucumber. 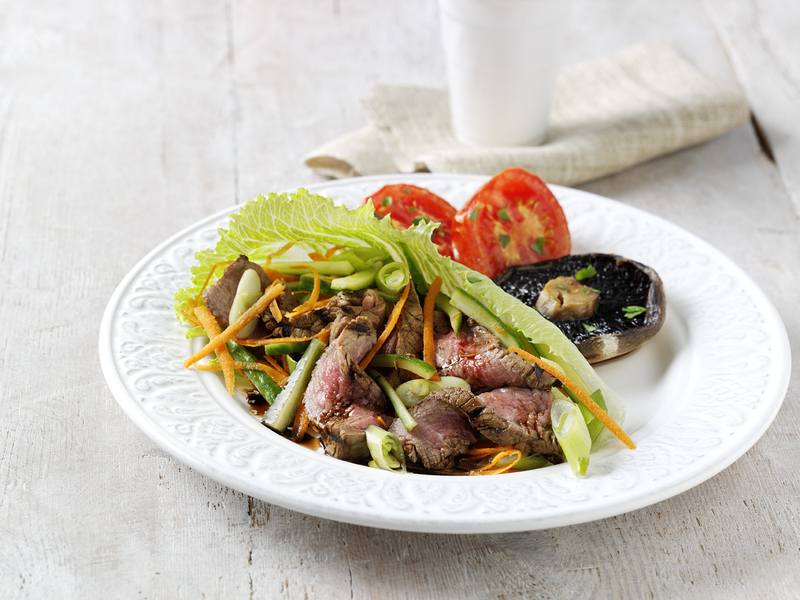 Serve on the lettuce leaves, drizzled with the balsamic vinegar and Worcestershire sauce, and the tomatoes and mushrooms on the side, scattered with the parsley.